This is a small group of gastropods (mollusks that create a single shell)that live in warm water regions. Sundails are sometimes called the winding-staircase shells. 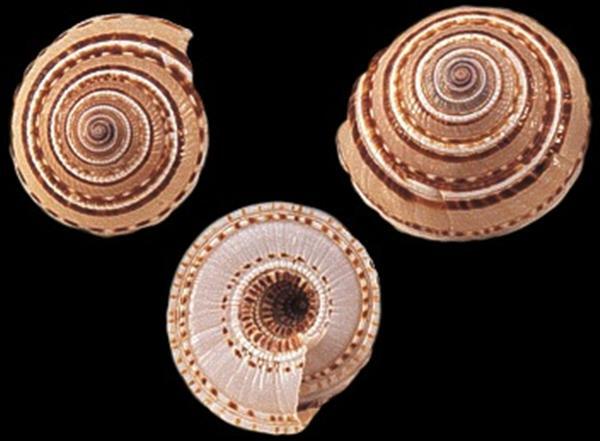 They have a wide and deep umbilicus (the opening at the base of a gastropod shell around which the shell body (whorl) coils). The body whorl spirals with vertical grooves creating a lattice pattern. The outer edge of the shell base is encircled by two flat-topped ribs. The Sundail color is gray to yellowish brown, with parallel bands of alternating white and dark brown. Sundails are flat and round. The aperture (opening at the bottom of the shell)is usually damaged along its edge. These shells were found across the Indo-Pacific region. This stretches from the Indian Ocean East across Northern Australian/New Zealand shores to just South of the Sea of Japan.